on a clear day it's hard to miss the Black Tusk's (7598 ft.) distinctive appearance from the top of Whistler. �like most, i've always been impressed by its "tusk-like" northeast side. �i don't know much about the peak, but the thought of skiing it or the terrain around it has intrigued me. �luckily, i finally got the chance to explore the area with Amar Andalkar and Matt Swallows on Monday. the night before our outting, we scoped out the conditions of the microwave towers access road. �(the towers are located to the west of the Tusk and the microwave road, which is ~8 miles long, is a common way to access the Tusk.) 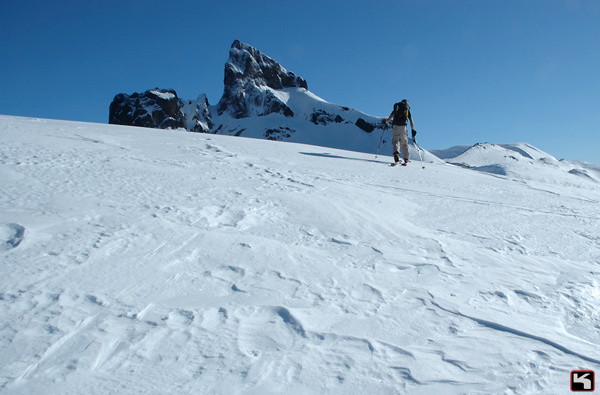 �on Monday morning, after a late start (11am) we returned and donned skis at 2900 ft., about ~3 miles from HWY 99, and began the long climb to the towers (~6400 ft.). the approach on the access road to the towers was 5-miles from our starting point. �the approach has some ups and downs making it feel long, but once at the towers, the view and the terrain opened up. �it's beautiful up there! skiing down the 200 vf. to the access road from the towers was painful. �the snow was heavily wind/sun crusted. �the ski down on the road wasn't much better and slow. �but since i'm easy to please, the untracked powder along side the road made me pretty happy. �i made a bunch of powder 11s . So THAT's why we didn't see you on Sunday. Cool trip. Glad you guys had a good weather and a good time. I'm assuming you skied the KK Garage Customs again. I'm assuming you skied the KK Garage Customs again. yes, i did. i also skied a few days on them at Whistler. they ski well and they like to go fast. the only complaint i have is they weigh as much as a pair of water skis. but i don't mind the width (135mm at the shovel) so much. anyway, Kelvin and i are working on a lighter, backcountry version. did you see Kelvin on the new Kung Powders on Sunday? too bad i missed you guys on Sunday. it looked fun! yes. the "other" plumber's crack is steep and deep. i made a photo of it. wanna see it?? did you see Kelvin on the new Kung Powders on Sunday? Nice pic by the way, Kam. Kam, sorry not to be able to get together for turns after seeing you and Allyson at Whistler on Saturday; the week was dedicated to lift skiing with the family - lots of vertical on "East Coast" like hard pack. Went out a couple of times at twilight for rando laps (Whistler patrol freaked out once when I started skinning up just before sweep, so it had to be after 5:00 PM). Quite a few interesting potential touring sites visible from 99 to the north of Whistler as well - locals said that Wedge Mt. (three peaks N. or Blackcomb Glacier) and Mt. Currie (just S. of the town of Pemberton) can be epic, but lack of snow this year makes the approaches a bummer. it was a wonderful surprise to run into you and your family at Whistler. maybe next time we'll be able to take a few runs together. as for the snow, i agreee that it was hard in places, but i managed to find really fun stuff off Spanky's Ladder at Blackcomb. most sheltered aspects kept the snow relatively soft, and most importantly, carvable! you could easily sink your edges. Amar and i ran a few laps on Spanky's with smiles, but found the luge course at the bottom interesting. all we did was straight run it hoping for no surprises from other "quasi-static" skiers on the trail . at Whistler, the slopes below the cornices on Whistler bowl were nice -- very carvable, but fast. surprisingly, the homemade skis (the Ahmas) that Kelvin and i made handled the conditions well. we'll mount rando bindings on them for you to try. i know you're dying to ski a pair of eye-ball engineered skis .